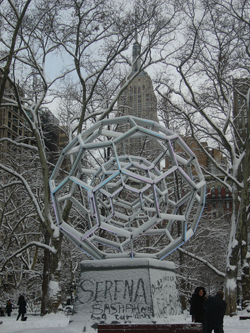 A buckyball in Madison Square. Yesterday we opened the Plus New York office, amidst snow covered streets at the foot of the Empire State Building! The day started with a trip to MoMath, the recently opened maths museum in central New York. It was filled with a fascinating array of interactive exhibits demonstrating the beauty and playfulness of mathematics. And as one of the volunteers told us, playfulness is what it's all about. There were musical spheres demonstrating the maths of music, a fractal machine with cameras creating fractals from their surroundings, and a chance to discover the paths of mathematical rolling stones. It was full of children and the young at heart discovering the joy of maths for themselves. We also discovered an illuminated buckyball in the park just across from our hotel and the arithmetic of relationships in the High Line park. Maths is everywhere in NYC! 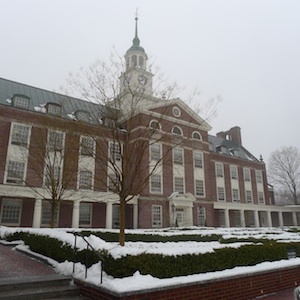 The Institute for Advanced Study in Princeton. Today we had a very early start, taking the train from New York Penn Station to Princeton to visit the Institute for Advanced Studies. We were very lucky to speak with Freeman Dyson and Edward Witten about quantum field theory (QFT), the mathematical framework that has made much of the advancements in physics possible in the last century. This is the main reason for our trip to the States and we are looking forward to more interviews this week with other luminaries of theoretical physics to continue our series telling the story of QFT. You can read our first articles here. We'd like to thank Jeremy Butterfield and Nazim Boutta, our gurus in QFT for all their help in preparing for the trip! After a Manhattan or two tonight we're heading to Boston tomorrow to continue our quantum adventure! 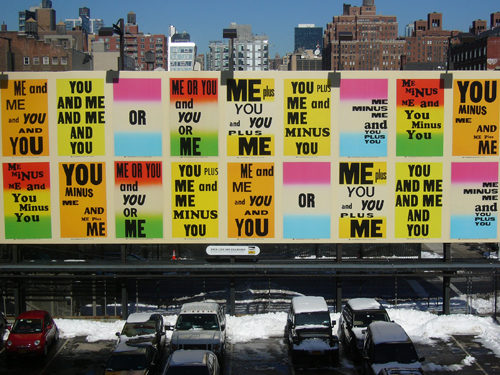 The arithmetic of relationships on the High Line.